The Pan American Highway, the Sea to Sky Road, the Wild Atlantic Way – iconic road trips deserve evocative names and these certainly hit the mark. London’s famous “M25”, then, seems just as thoughtfully titled: a bland, featureless name for a boringly circular road. Indeed, the only interesting trait is the irony of an ‘M’ for motorway, despite the inevitable crawl at 40 miles per hour. It truly is one of the UK’s most hated roads – a monotonous grey loop, arch nemesis to the buzz of London. So what better way to prove the thinking behind every road trip; that it’s not the road you travel on but the way you choose to travel it. Cue soundtrack to The Fast and the Furious, a fresh copy of the new Cool Camping Britain book and a hamper full of cereal as I stroll into the reception room of Spaceships Campervans. If I’m taking on the world’s most boring road trip I should at least have an interesting vehicle and anything that calls itself a ‘spaceship’ has already got my vote. The doors slide back, the chairs spin round and the side table folds into place like a stubby spaceship wing. It also has an emergency DVD player. I’m sold. Initial lift-off is smooth. After the pre-flight checks and a brief navigational fault through the car parks of Heathrow Airport, I begin my journey around the M25, assuming an anti-clockwise direction. It’s Friday afternoon and already pleasantly hot so it’s handy that the first pit-stop is just one junction away, dropping off the now busying lanes of the motorway and down towards the village of Wraysbury. My guidebook describes the spot as a potential “West London Lake District” and, if it weren’t for the steady hum of the traffic and the alarmingly low-flying aeroplanes, it would certainly boast some oddly Cumbrian traits. Optimistic as it may have been, the book has convinced me to pack my swimming trunks and I leave my spaceship with all the confidence of someone truly on a mission. One small step for man and a shivery, pale-skinned leap for mankind sees me slip into the watery depths of Colne Brook, a tributary of the Thames, for my first wild swim of the season. The chill of the water pushes a desperate gasp from my lungs and I paddle like a frantic dog to warm up, only settling in as my teeth begin their chatter. Stroking out across the breadth of the narrow river, it's an easy clamber over the bank into a larger expanse of lake, one of many in the area. This maze of gigantic puddles is actually a network of old gravel pits, left from London’s building boom and now filled with glistening spring water. They possess an odd serenity given the location and act as a first treasure along the 117-mile road. I’ve only gone four miles – so far, so good. In fact, the immediate choices as I saunter through the next few miles are surprisingly bountiful. I stop for a brief wander beneath the gangly American pines of Windsor Great Park and bypass it’s namesake castle, along with Thorpe Park and RHS Garden Wisley – the flagship garden of the Royal Horticultural Society that’s a mere mile from the motorway. It’s only when I get to Ockham that I hang up the keys for a while, enjoying the busy local gastro pub that defies its middle-of-nowhere feel. It takes a while to find The Black Swan, through quaint Surrey lanes, but once there it hums like the M25 itself, warm with the sound of chatter and clinking glasses. It’s a shame UK driving laws even apply to spacecraft and I’m forced to forego a pint of Shere Drop Ale from the local Surrey Hills Brewery, instead parking up for the night, safe in the knowledge that the next morning, I’ll be heading for that very place. Dawn breaks, the curtains are drawn back and my cereal hamper takes a quick hit before I set off on a brief stroll around Box Hill. As expected, the small roads running next to the motorway are speckled with colourful cycle shirts and I plod along behind a squad of hill seekers, leaning menacingly over their handlebars. The Surrey Hills Brewery is not exactly my destination though. It is tucked alongside a far larger boozy partner and it’s here I plan to enjoy the greatest escape from the M25 – a tour of England’s largest vineyard. There really is something foreign about Denbies Wine Estate. Our guide on the Land Rover-led tour around the slopes explains that the geology matches the French champagne region - and on this sunny Saturday, the weather matches it too. 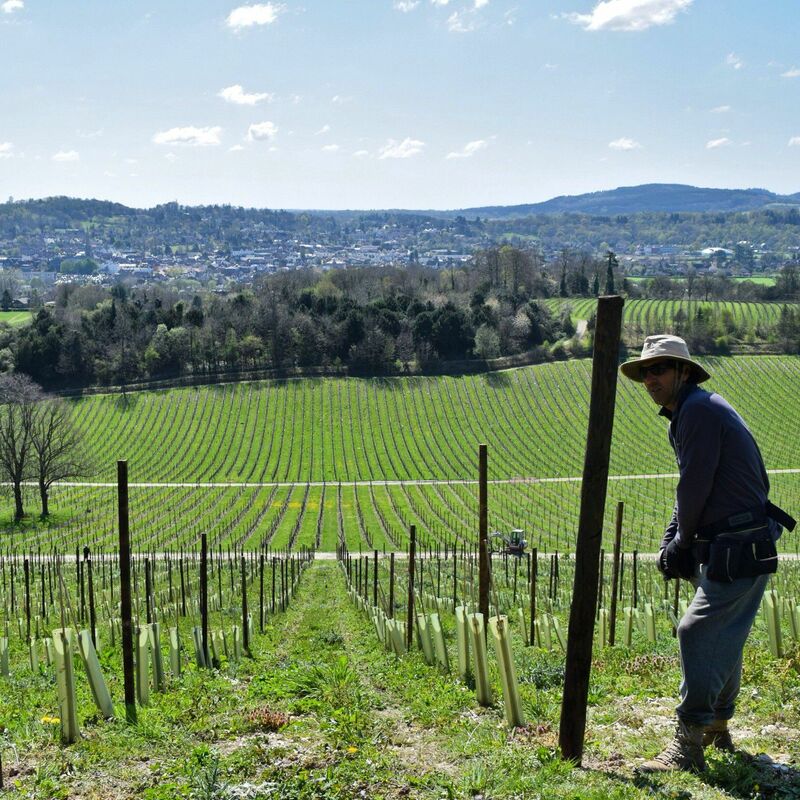 Striped by the brown of spring vines that are only just beginning to bud, the south-facing valleys run like smart corduroy down to the winery that sits in the centre. Inside, “the experience” has somewhat taken over, with a pleasant shop, accommodation and a conservatory café, but the tour through the winemaking process and down into the cellar is still fascinating – ever contrasting itself with the big French competitors. In the underbelly of the building we sniff, swell and sip at three different wines and discuss our new found knowledge, inevitably picking up a bottle or two on the way out. It’s around 20 miles to my next stop. The motorway is as clear as the sky and the road trip is bringing all the pleasant surprises I had hoped for. The M25 would have been a surprise in itself to Sir Winston Churchill, who died ten years before it’s construction began in 1975, though thankfully it doesn’t blight the views from his old home, Chartwell House. It’s £14 for adult access to both grounds and house but free to National Trust members, many of whom become regulars, using the vast space for family picnics down by the lake. Mine is more of a flying visit, though I can’t help feeling a little envious. It’s clear to see why Churchill settled here. Inside, the house is preserved much as it was under Churchill and Lady Clementine's tenure with the exception of one additional museum area – particularly poignant on this 50-year anniversary of his death. It’s a real learning experience, taking you into the more everyday scenery where you see his life as a prolific painter, historian, biographer and keen bricklayer, and outside the kitchen garden echoes perfectly the practical spirit of the 'Dig for Victory' era. The long vegetable-shaped shadows signal that the afternoon is drawing to a close though. The wheels must keep on turning. It’s fair to say I don’t need telling twice. My layover for the night isn’t the late night layby of sleepy truckers. No, I’m halfway around the M25 and it’s time for a true escape. Courtesy of Cool Camping Britain I’m drawn down narrowing lanes to Badgells Wood, the most opposing scene imaginable to the stark white lights of a service station. Tall, slim chestnut trees splinter the last of the evening light and we find a quiet clearing amongst the 250-acre forest. 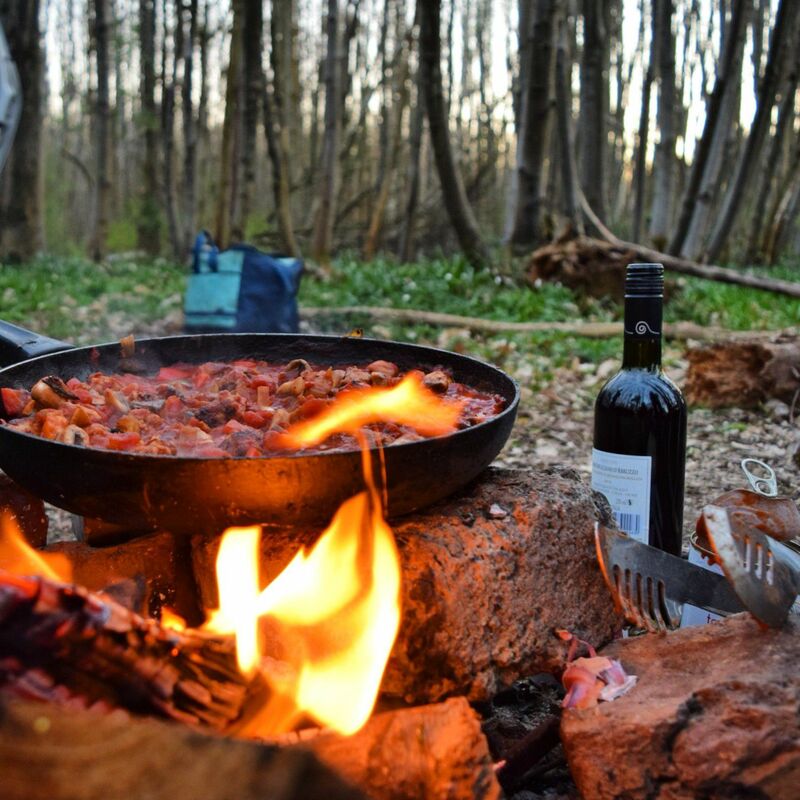 Sadly I must be around a week too early for the bluebells, currently like a green carpet across the floor, but never too early for a campfire, the first thing on the to-do list. Evening time is whiled away around the flames, enjoying the company of family who have joined me in trying their hands at burning marshmallows. The woods have a silence to match the darkness, only broken by branches clicking together in the breeze. Not even the sound of cars can penetrate the canopy; I’ve come too far for that. It takes being back on the motorway by morning to truly appreciate just what an incredible part of Kent Badgells Wood enjoys, though and sadly, I’m soon across the Thames and into the heart of Essex. Buckinghamshire, Surrey, Kent… it’s easy to think that now the fun is over. The grizzled north easterly loop awaits. Essex, though, still has a few surprises in store and by the time the motorway is curling around the top of Epping Forest I’ve already stopped twice amongst the trees and again moments later in the quaint old high-street of Waltham Abbey. It’s top secret, however, where I’ve spent most of the afternoon. At least it was until very recently. The now dubiously named Secret Nuclear Bunker, in Kelvedon Hatch, is around five miles from the motorway and fittingly located beneath the car park into which you arrive. There’s little to signal its existence. 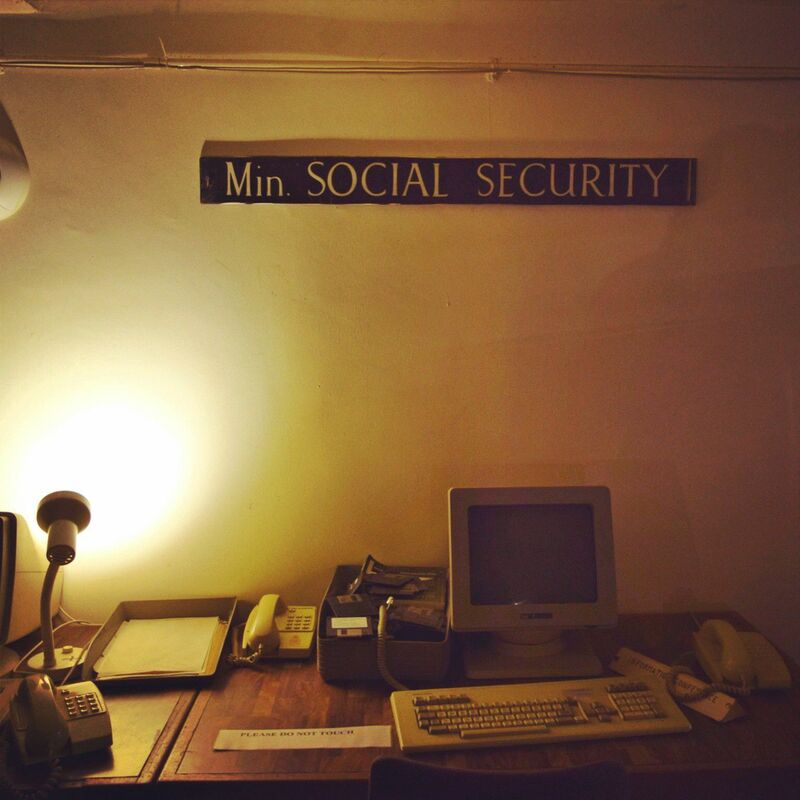 Designed to hold up to 600 personnel, including the Prime Minister, the bunker is a fascinating look into the genuine fear during the Cold War era. Even the long corridor through which you travel to enter the multiple sealed doors has a spooky, clandestine atmosphere and once inside the three-story underground bunker is laid out in its exact 1960s setup. This was where, come the devastation of an atomic bomb, the UK would begin its reorganisation while radiation settled. Fortunately it never faced more than drills and exercises. It’s a radio earpiece tour that leads you through the bunker, an appropriately low-key visitor experience for this quiet spot in the countryside. There’s something simplistic about the way it’s all run, as though the place has been abandoned and you’re strolling through the debris of paperwork and war-office filing. Not that it wants changing. The authenticity of it all is what provides the real attraction – a quirky piece of history that lingers in your memory as you stumble back out into the evening light. As another day ends it spells the final whistle on the weekend. Sunday night is another from the guidebook, this time requiring a bit more of a detour and arguably leaving the rigour of my M25 route, but not without a final roadside stop. My departure from the motorway takes me via ginormous St Albans Cathedral, a largely Norman structure with the longest nave of any cathedral in England, and only then am I on east to my resting point in the fringes of the Chilterns. Town Farm Campsite is an ideal place to bring my spaceship back down to earth – though the views are heavenly – and by the light of yet another evening campfire I sit back and ponder on the weekend’s activities. The normal travails of the M25 have been viewed through my campervan-tinted glasses and by taking the time to slip off at interesting junctions and discover the very things that the road aims to bypass, I have seen its lighter side. It may still be the most boring road trip in England, who knows? But if it is then it certainly shows there are some incredible road trips to be had. If this is merely the baseline then how great must the top rung of the ladder be? Lambs bleat in the field that stretches out before me and in the morning the sun rises over the knuckled edge of Ivinghoe Beacon. I return to the tedious jam of the M25’s Monday morning traffic and remember why we love to hate it. I’m already running late. 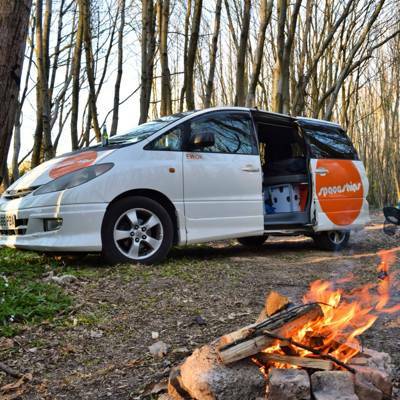 Campervan hire from Spaceships Campervan Rental (02085 732300) starts from as little as £19 per day. 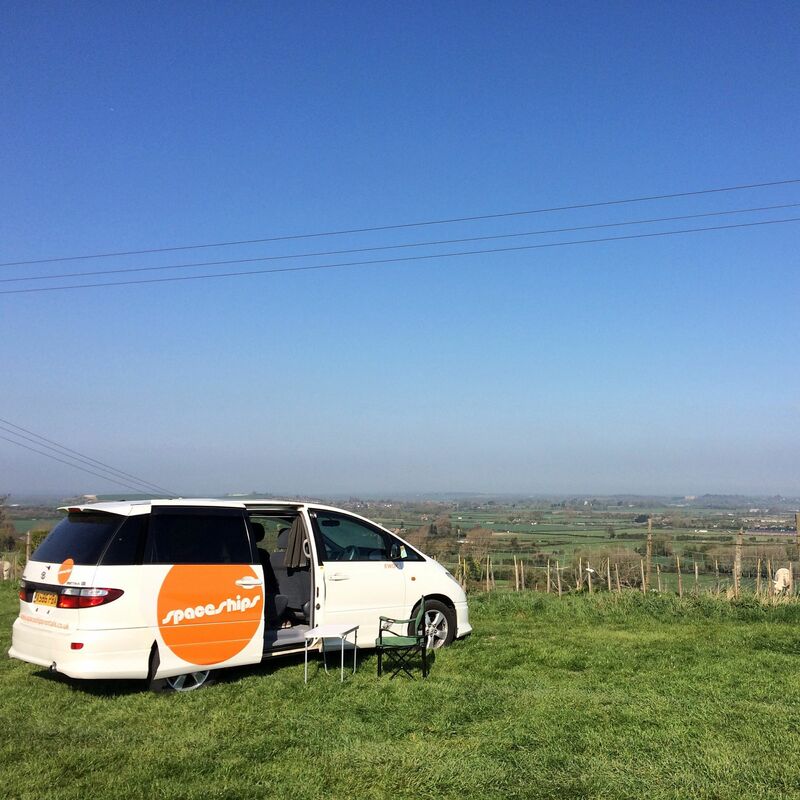 Search for other campervan hire options near you on our new campervan search page. Bluewater Shopping Centre (01322 475475, Junction 1); Lullinstone Roman Villa (03703 331181, Junction 3); Knole House (01732 462100, Junction 5); Chartwell House (01732 868381, Junctions 5/6); Denbies Wine Estate (01306 876616; Junction 9); RHS Garden Wisley (08452 609000, Junction 10); Big Hat Bushcamp (07957 184341, Junction 12); Thorpe Park (08716 631673, Junction 12); Windsor Castle (02077 667304, Junction 15); Wild Swimming in the Colne Valley (Junctions 14–16); Warner Bros Studios (08450 840900, Junction 20); St Albans Cathedral (01727 860780, Junctions 21/22); Waltham Abbey (03703 331181, Junction 25); Kelvedon Hatch Nuclear Bunker (01277 364883, Junction 26); Dartford Bridge (Junction 31).